There’s lots to be excited for British and Irish poker fans at this year’s WSOP. UK and Ireland players have now won more than $4m and have cashed in all but seven of the 50 events completed so far. Chris Brammer’s victory in the $5k NL event brought the gold bracelet tally to three; check out our report on UK/Ireland cashes at the WSOP halfway mark. Several Brits are in great shape in the $1,500 NL Bounty, $3k NL 6-Handed and $1,500 tourney. British pro and commentator Tom Hall is going strong in the $1,500 NL Bounty; he’s in seventh place with 29 players left. He’s had 10 WSOP cashes in all, including three this year totaling more than $50k. There’s $266,646 up top for the winner of the bounty event with all those left guaranteed at least $6,854. Max Silver, Benny Glaser and Stuart Rutter are all thriving for Day 2 of the $3k Limit 6-Handed event. Silver, who has already cashed twice at this year’s WSOP – including $73,510 for sixth place in a $3k NL tourney – is in 12th place with 50,400. Glaser, who has already won more won more WSOP bracelets than any other British player (three!) 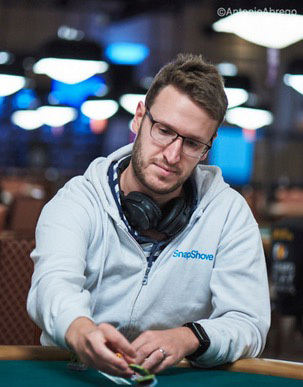 – and narrowly missed winning a fourth with a runner-up finish in the $10k Seven Card Stud Hi-Lo event – is currently in 29th place for Day 2 with 28,600. Stuart Rutter is still in but short on 19,200. There are 73 players left with Finnish pro Juha Helppi leading on 146,000. Meanwhile, in the $1,500 tourney (event #52), Unibet London champ Pratik Ghatge – who was eighth in the $2,620 Marathon for $70,590, goes through to Day 2 in ninth place with 101k. Brighton-based German Rainer Kempe has 93,600 and a clutch of other Brits are also still in the running. There were 1,580 entries and 246 remaining, with $364,438 for the winner.